UPDATE- You will never believe the results of my allergy testing. I had the skin test done today. Let me just tell you... Anyone that tells you that it's no big deal is lying to you or they like to have pain inflicted on them. I cried. Yes, I did. Here's what it looked like right after she got done with the pricking. ( and my Mom is going to call me and say, "Sissy, you need to get that mole on your back checked." lol. I have already and the doctor thinks it's ok and we are watching it. Here's when I started getting some reactions. The #2 is a control. You can see that I already have some gnarly positive reactions. Surprisingly, though... 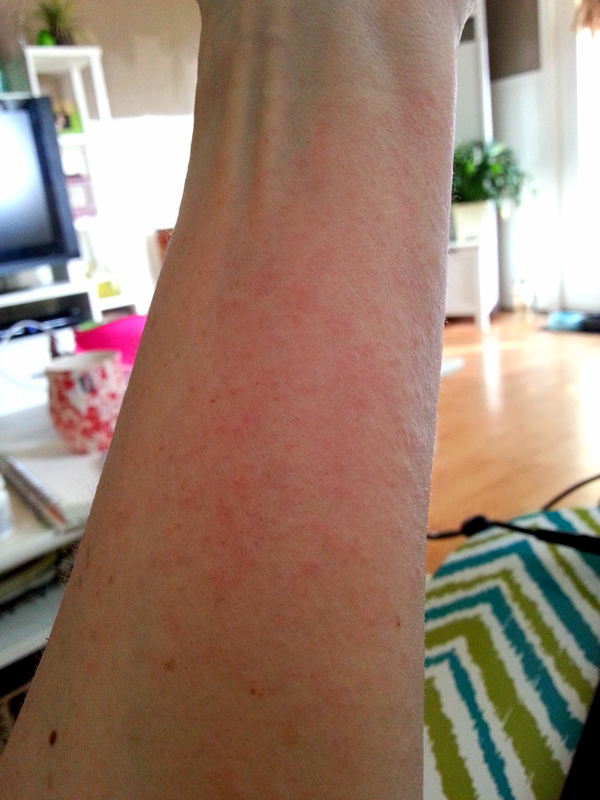 I thought I would be allergic to EVERYTHING, but there are lots of places that aren't reacting. You can see on this side there were many that had very little reaction or no reaction at all! I am not going to list everything I was and wasn't allergic to (because who has that kind of time.. and who cares..), I will get right to the good stuff. I am allergic to all the usual offenders. Ragweed, grasses, trees... you know, the whole outside. I am just allergic to the whole outside. I am also allergic to Dust and mold. I was pretty sure I would be allergic to those. I eat a PB&J at least 2 times a week. His suggestion was to keep eating it. If I was having no reaction then there's no need to stop eating it. I just need to pay attention to any potential reactions. He thinks it's actually good to eat it because it is desensitizing me to the allergen. I don't think I have ever eaten it. I am not allergic to other fish or seafood... but flounder. Random. Here I am drinking Almond milk every day because I am intolerant to milk. He repeats what he said about the peanuts.... so, I will keep drinking it. Oh my gosh. I mean, I knew it... but I was hoping it wasn't that bad. I am not one bit allergic to dogs though. I am allergic because I was bitten by a tick. I have a rare food allergy called alpha-galactose or "alpha-gal" for short. Doctors say only bites from Lone Star ticks can cause this reaction, and those ticks are common in Middle Tennessee. A Blood test confirmed an alpha-gal allergy. Here are some other links. I am still learning and researching. Never in my life had I heard such a thing. This is life changing. I have to completely change my eating habits. I am also taking an allergy medicine every day to help with all the allergies I have, but this will not help with the alpha-gal allergy. I still plan to use as many organic/chemical free as I can, but I am no longer worried about a product causing this severe reaction. 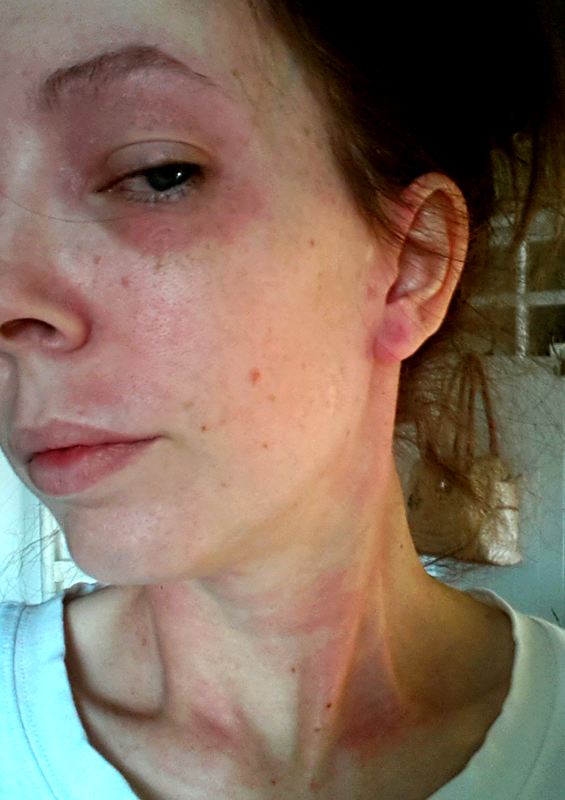 I know I still have a sensitivity to some beauty products, but the reaction is nothing compared to what happens when the hives and swelling happens. My reactions to the beauty products are mild and generally contained to where it's applied or places it came in contact with. I will still have a patch test done to see what I have sensitivities to. We plan to eliminate as much allergens as we can. I know it's not possible to live in a bubble, but Danny is going to make sure to get rid of all the mold in the house. The bathroom has mold in it and he is going to completely tear out anything that has mold on it. This is going to be a big hassle, but it would have needed to be done anyway. It's not healthy for anyone. I will also be putting an allergen bed cover on the bed, and a cover on the pillows too. I will wash the bedding more often. We have very little carpeting, but one area of carpeting is in our bed room. Vacuuming the floor as much as possible (once a day at least) with a vacuum that has a allergen filter will help. I realize none of this will help with the Food allergy, but at least my regular allergies will improve significantly. We have also decided to re-home the cat. I hate to even think about it, but I am so allergic to Libby. I have always been allergic to cats, but it got better as I got older. Now, it seems to have come back full force. I would like to keep her, but with her hair on everything I just can't escape it. I was given the option to take allergy shots which will do a better job of keeping my allergies in check, but to be honest... I would rather take the pill every day and just try and keep my environment as allergy free as possible. I just want to feel healthy. I am already feeling so much better now that I am on day 2 of allergy medicine and I am not eating any meat. I can't wait to see how much I will improve one we get rid of the mold and get control of the dust. I have already gained a lb since Saturday! I was so excited that I made it to 100 lbs, now I am over 100 lbs and holding steady. I would like to get up to about 110 - 115. I know it's crazy, but I am so relieved. I lived in fear every day that something around me would cause this reaction. 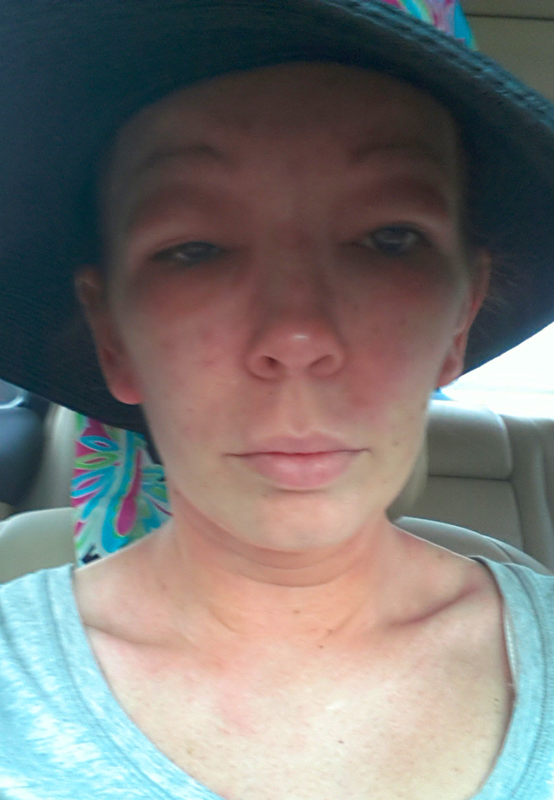 I was afraid of waking up in the middle of the night with a completely swollen face and hives. I had no idea what to even stay away from. Now I know. I have the knowledge and I can move on and protect myself. I will continue to Update on how I am living with this rare food allergy. Side note-- I have had so many people praying for me, sending me messages, texting me... It is so overwhelming. Thank you all so much. I truly believe the prayers helped in so many ways. You have no idea what it meant to know that I have people that care about how I am doing. Thank you again. Could my makeup and beauty products be killing me? 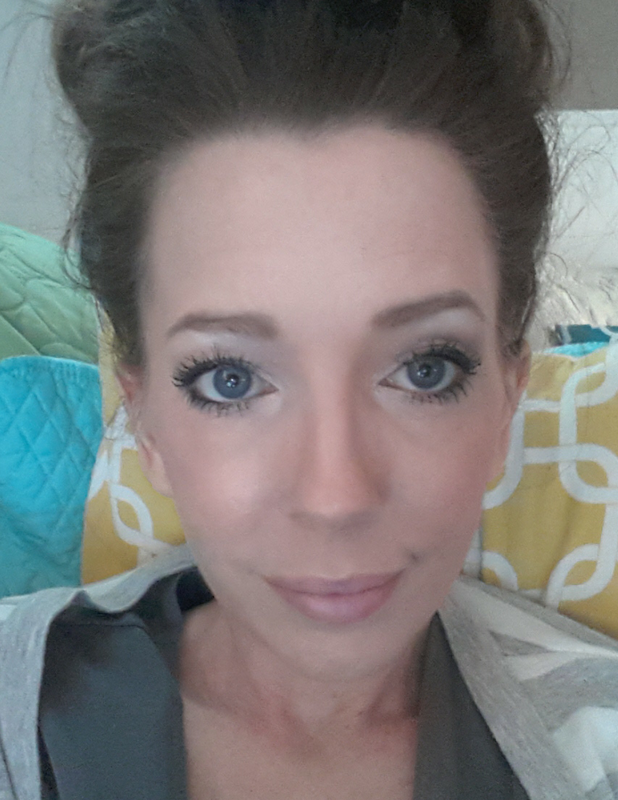 What happens when a makeup/beauty junkie has an epic allergic reaction-. ...AND has NO IDEA what caused it? The Headline of this post and that picture was meant to get your attention. Did it? I hope so. While I doubt that my beauty products are killing me (well.. perhaps killing me slowly.. I don't really know)... I think they are contributing (along with several other unknown things) to my decline in health. Let me try to answer some of your questions without really knowing what is 100% going on myself. I have lots of history with allergies. I was very allergic to most everything when I was young. 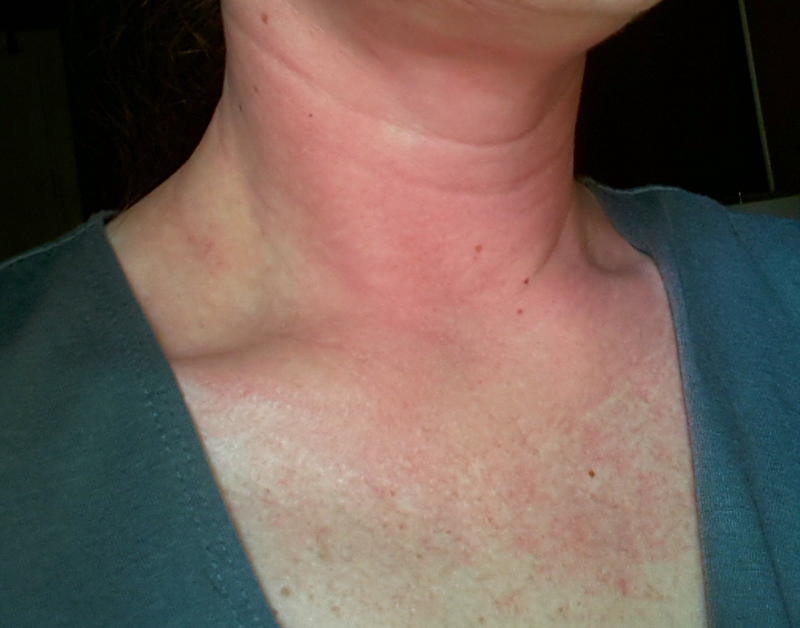 Going outside to play usually resulted in coming back inside with hives. I was allergic to pollen, plants, animals, fruits...etc. I outgrew most of the allergens that would break me out in hives. I have always had problems with food. Either I was allergic or intolerant. I have suffered from rashes all my life. They come and go. Usually, they go rather quickly and I don't worry much about it. Starting at about the second week of June I had a small rash that started on my neck. It slowly spread to my face, ears and eyes. I had just gotten off of antibiotics for a bladder infection so I thought that it may have been a reaction to the medicine. We had also just got back from vacation in the Smokey Mountains where we took a hike the day before we left. I wasn't ruling out that I may have come in contact with something that I may have been allergic to. I took these pictures as like a "What the heck?" to send to my husband. I didn't intend on taking pictures to document the ongoing rash... but, I am glad I have these first pictures. If I had to narrow down the products I was using in my daily life at this time it would have been IMPOSSIBLE. 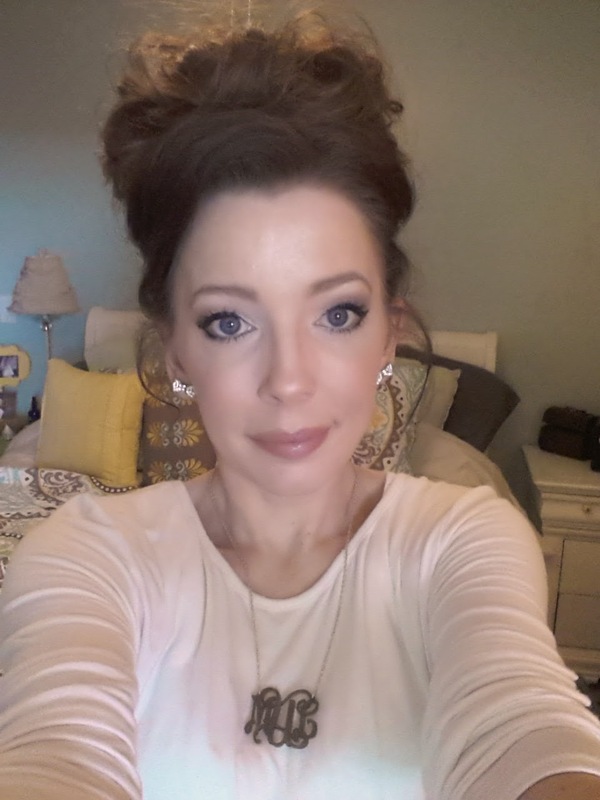 I am a self proclaimed beauty and makeup addict and I am always trying new things. I didn't put any makeup on here (obviously)... I didn't want to aggravate or irritate whatever was going on here. I only had a moisturizer on. It got worse before it got better. Before long the rash was less red, less irritated, and was starting to peel. I mean, it started to peel terribly! By the last part of June... The peeling was nearly gone, but I still had some spots that were terrible. My forehead, hairline, ears and neck were peeling the most. 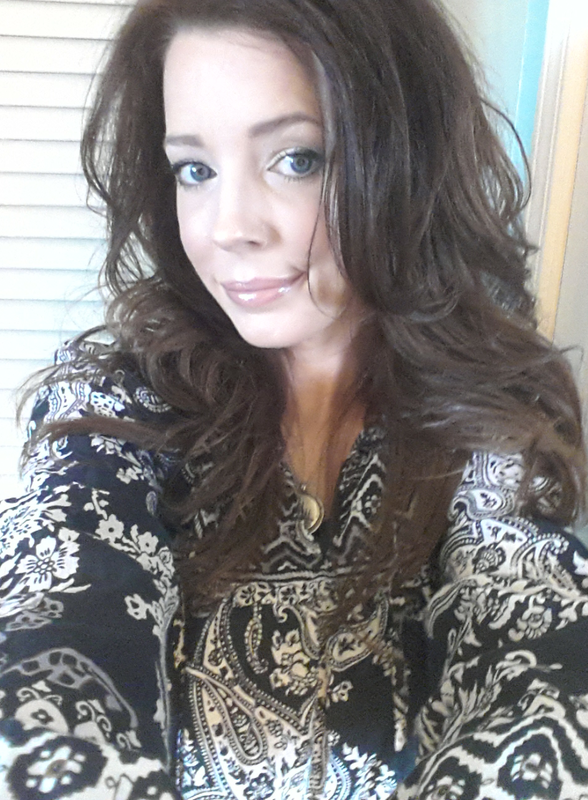 ---full disclosure... after the peel I did color my hair as I do every 4 weeks. 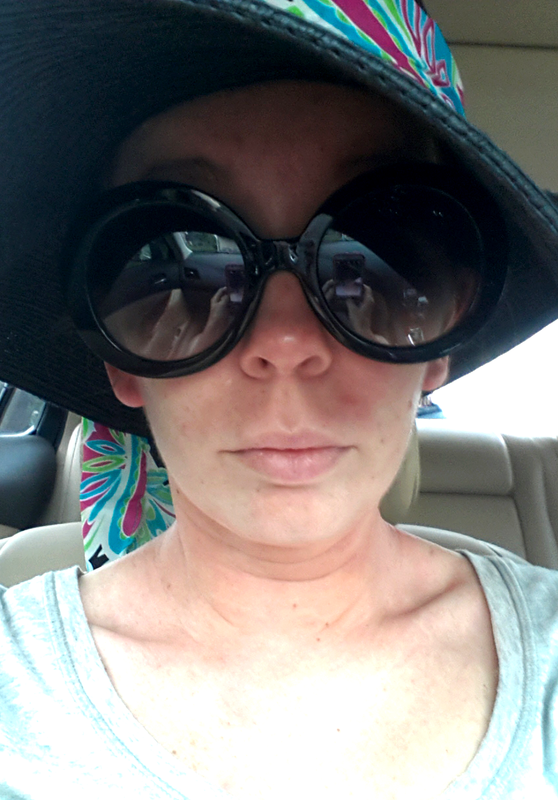 This is how I looked all covered up on my way to the Urgent Care center. I got a good shot of Benedryl and Cortisol in my behind and I was sent home. The Doctor thought that it was more than likely a reaction to the peel I used. I am not going to even attempt to describe how terrible I felt here. I was so sensitive to light and heat, and basically life. I could only lay in a dark, very cold room with cold compresses on me. My eyes and face actually swelled worse than this. It actually swelled so bad that it was compressing my eyeballs. Once the swelling went down, I looked like I had been punched in the eyes. I am guessing that the capillaries around my eyes burst and caused my eyes to look bruised. I could go on... but I have a tendency to whine so I will keep that to a minimum! 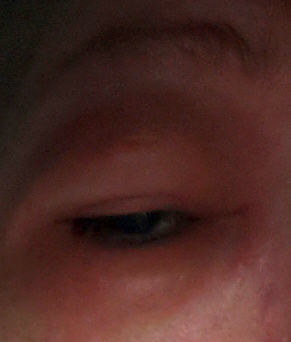 This one of my eyes once the swelling started going down. The next few days/week are a blur. 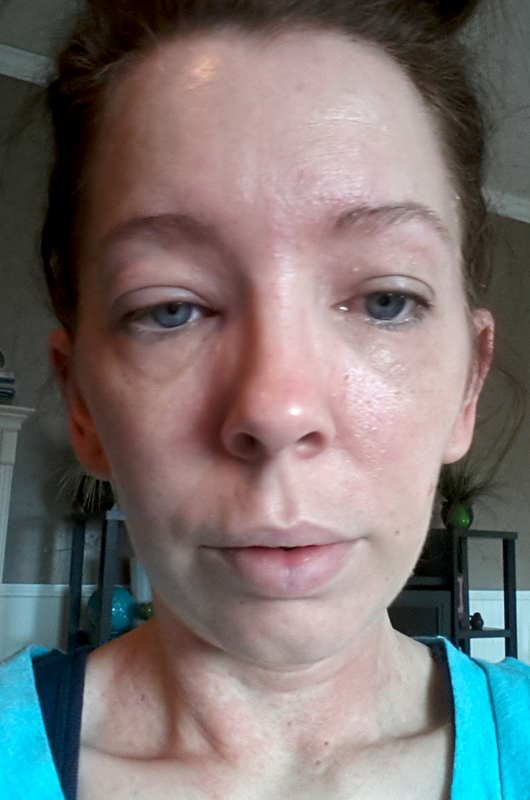 The steroids and Benedryl helped with the rash and swelling... but within a week it came back. It came back JUST like this again. I didn't do ANYTHING to cause another reaction. I didn't use anything on my face. I was still taking 2 benedryl every 4 hours and this happened again! With the "relapse" we decided it was time to go to a dermatologist. JULY 9th- I had my first DERMATOLOGIST APPT. The Dermatologist looked at me, took my history and thought that the most likely cause was an airborne allergy to poison ivy/oak that I most likely came into contact with when someone was burning some poison ivy/oak. He said that at this point it looked like it was in my blood system and I was going to have to take steroid shots every week for the next few weeks to get it totally out of my system. 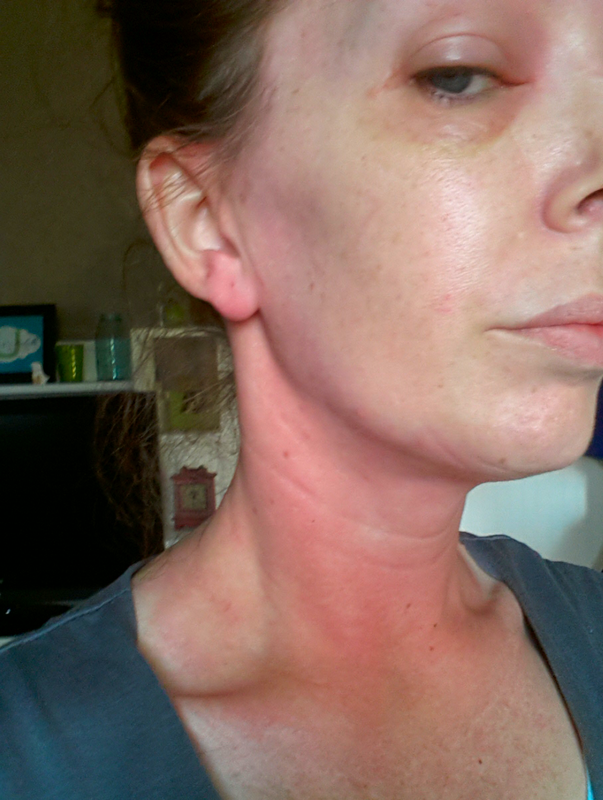 I was also given a topical steroid cream that I would apply to all the affected areas twice a day. I did not do well on the steroids. You know how some people eat everything in their house and get a burst of energy and can't sleep. Well... I am the exact opposite. I could not stomach anything. I couldn't eat and I slept all day. I lost weight... then more weight. I felt terrible and it didn't help that my whole head was on fire. Then... it got better. Thank God. No rash!!! I was ready to go for a ride on the boat. Unfortunately, there were boat problems and I think we went shopping instead. I changed my attire, of course. It felt so good to get out of the house! Around this time I decided to be proactive with my health and the health of my skin and I switch to all healthy cleaning products, clothes washing detergent, body wash, body lotion and face lotion. I was still dealing with the aftermath of the terrible rash. 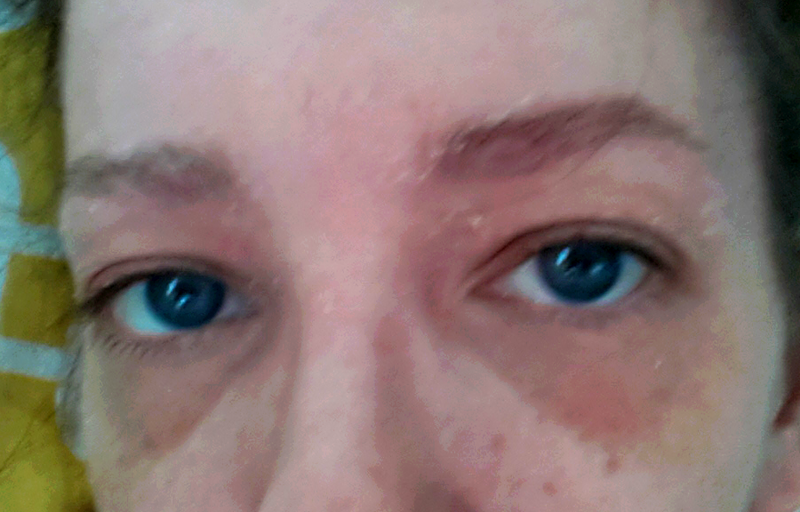 My eyes still looked black underneath and I still had the dry, peeling spots. I used really emollient lotion on those spots and it helped. My brother and his family came in to visit and we had such a great time! We went to the lake and spent time at my Aunt and Uncle's lake cabin. 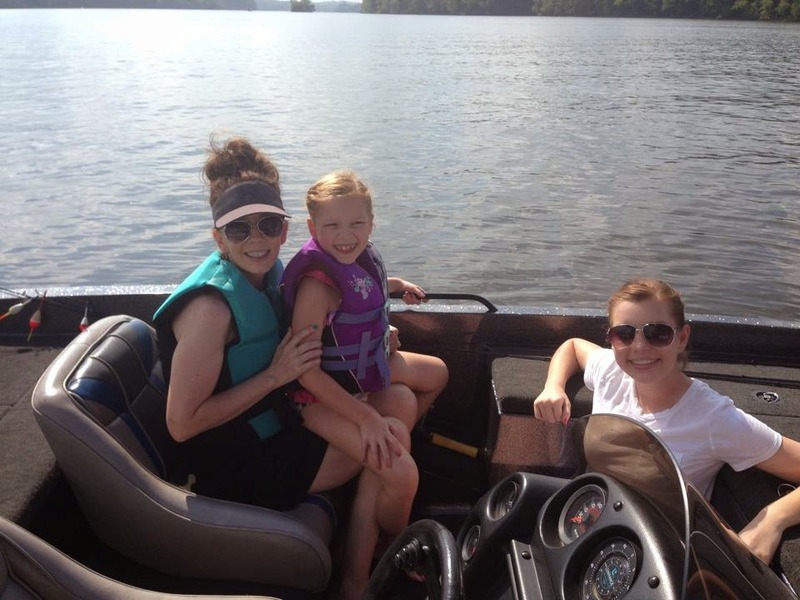 We went out on the water.. we had such a good time! I had a little bit of a rash on my neck, and eyelids but it was being controlled by the meds. I was thankful that I felt well enough to get up and get out. I really enjoyed the time with the family. I was down to about 103 lbs here. I was having a hard time eating. The medicine that I was taking to keep me from having those horrible allergic reactions were also causing horrible side effects. During this time I was still on steroids. (I think at this time I was just on the topical steroids. I was being weaned off so that I wouldn't have a rebound reaction) It was rare for me to get out. I never had the energy to get ready and leave the house. Here's how I spent most of my time... on the couch. If I wasn't on the couch, I was in bed. I had to keep a cold compress on my neck. If I remotely got hot or do much of anything, I would break out. You can't really see it here... but the rash was back on my neck... and under my makeup I was already getting the rash back around my eyes and ears. I believe the only reason I even put on make up was because I had something to do. I never just put on makeup "just because". At this time I was not on any medication but Benedryl. Yup. I was ON FIRE! I was miserable. Benedryl around the clock and pretty much home bound, miserable and losing weight like crazy. I couldn't eat. I am not sure whether it was residual effects from the steroids, or maybe my insides were reacting like my outsides and was completely inflamed. I didn't leave the house unless I had to and I couldn't even get up to do anything around the house. I had my good days and bad days... these were some of the worst days. I felt completely useless, depressed and scared. I didn't know what to do to get better. I didn't even know what was making me so sick. More disgusting pictures.... These were all taken August 15th. This was right before I totally swelled up again. By that night my face was completely swollen again. Again... I didn't even capture how red this was. It was GLOWING red... and it was radiating heat and itching so bad. Oh, I also started losing some of my eyebrows and some hair in my hairline. Another awesome side effect to whatever was happening to me. Notice the bruising under my eyes and the peeling. It was horrible. I felt like I needed to detox all of these medicines and toxins from my system. I decided to take an Epson Salt bath the night before. I ended up with a rash all over my body. AWESOME. Back to the derm. I went. Instead of another steroid shot I was given the Prednisone pack. I reacted the same way I did to the shot... the stomach problems, no hunger, extreme tiredness... but it did clear up the rash on my body totally. On the last day of the pill dose pack, the rash on my face and neck came back. I nearly lost it. I was disappointed and completely defeated. 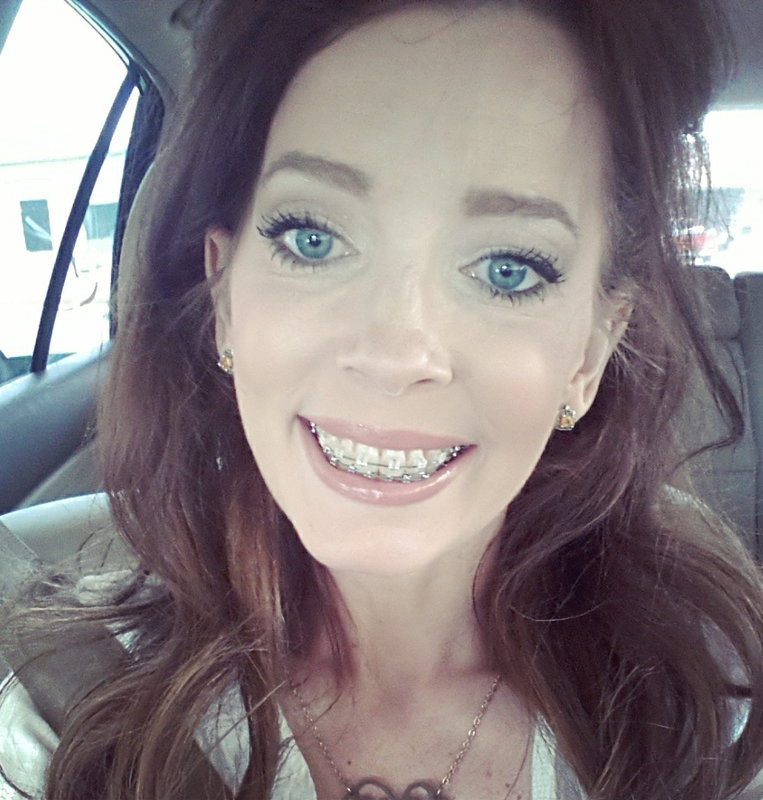 I had an orthodontist appt. The amount of makeup I had to put under my eyes to hide the blue/bruised discoloration was unreal. I came home after this and slept for hours. Just doing regular things like appts. and shopping totally wear me out. Still trying to fight off the rash with the medicine and it took every bit of energy I had to get ready and show up to a dinner. I don't know if you can see the rash... Most was covered by makeup.. but it was there. Most was on my neck. I look sickly with all the weight I lost. 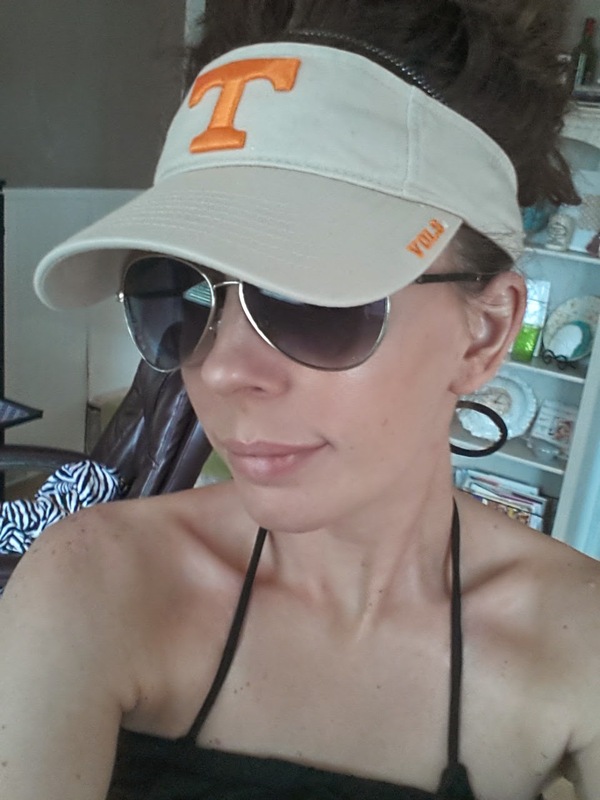 Took a picture here to show the Victoria Secret Sport wear I was sent to review from Influenster. I had no makeup on. 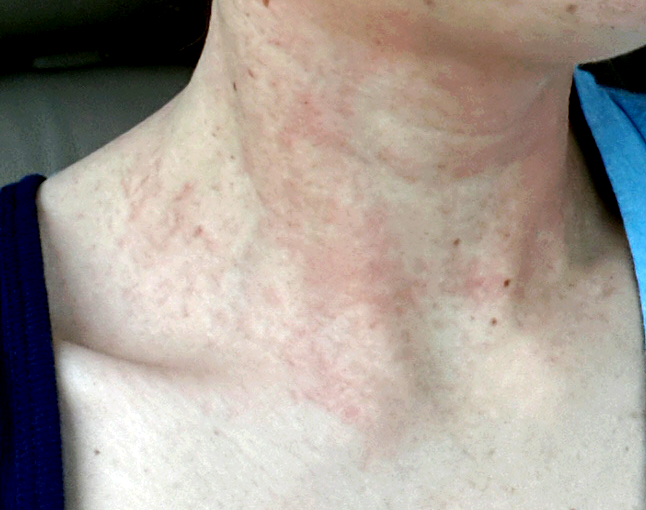 The rash was on my face and neck. I was trying to hide it. Not to mention my eyes still look like I had been punched. When this picture was taken I was down to 98.5 lbs. If anything, this allergist is thorough. He asked me everything from the time I was born until the present. He gave me a list of things that I can't eat or drink as well as medicine that I cannot take. This includes my eye drops, benedryl, or any allergy medicine at all. Also, he wants me to not use anything on my skin, esp. any type of steroid or cortisone. Now we have a plan. Hopefully we will figure this out. I am weak. I am still trying to gain energy and weight. 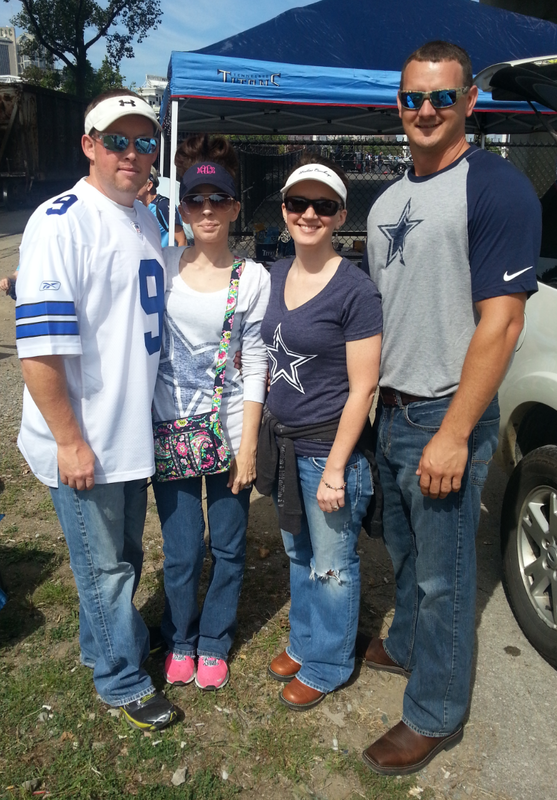 We went to the Titan vs Cowboys game on Sunday September 14th and it's clear that I wasn't ready to be out and running around yet. It was a little bit of a set back because I got so fatigued and dehydrated that I thought I was going to have to go to the hospital to get an IV. I loaded up on Gatorade and snacked as much as possible and made it through. He sent me for panels of blood work to help us figure it all out. Luckily, my friend was the one drawing my blood and she took really good care of me. These tests should provide lots of answers. Small CT SCAN update- My initial CT scan of my sinuses are in. (I was able to access it online). It's negative. No swelling, inflammation or any other concerning problems. I was shocked. I have always had terrible problems with my sinuses. I will know more when I visit the ENT. It's crazy, I was telling the lady performing the CT that this is the first week that I haven't felt the headache/pressure or swelling from my sinuses. I know I was on steroids and lots of benedryl for a while, but I haven't taken any for more than a week (per instructions of my allergist. I have to be off everything for a week before my allergy tests.) He told me that sometimes the sinus problems can be helped with diet. He gave me a strict list of things not to eat. (milk, sulfates, msg... etc) and my goodness... maybe we are onto something. Seriously, though... do you know how hard it is to cut all those things out of my diet... especially since I am allergic to most raw vegetables and fruit? (even though I do kind of cheat with the less offending veggies and fruits) He did tell me to try and not eat any of those things that cause ANY reactions during this week. That rules out most everything. Oh, and prepackaged foods are the worst and I must avoid those. I know this is just the start of the journey, but it is exciting to see that one thing could be getting better! I have started to gain a little weight back. I was at 101 this morning. It's going to be a long road, but I think we will figure this out. It is a process of elimination. When speaking with the Allergist, I got the impression that he believes it is a combination of a contact dermatitis, environmental allergies as well as food allergies. These tests will go a long way with helping me become healthier. It will be nice to know what things I am allergic to. I have to be super aware of what I put into my body as well as on it. I also have to be aware of what I come in contact with. I will be reading ingredients in everything. EVEN my makeup and lotions. 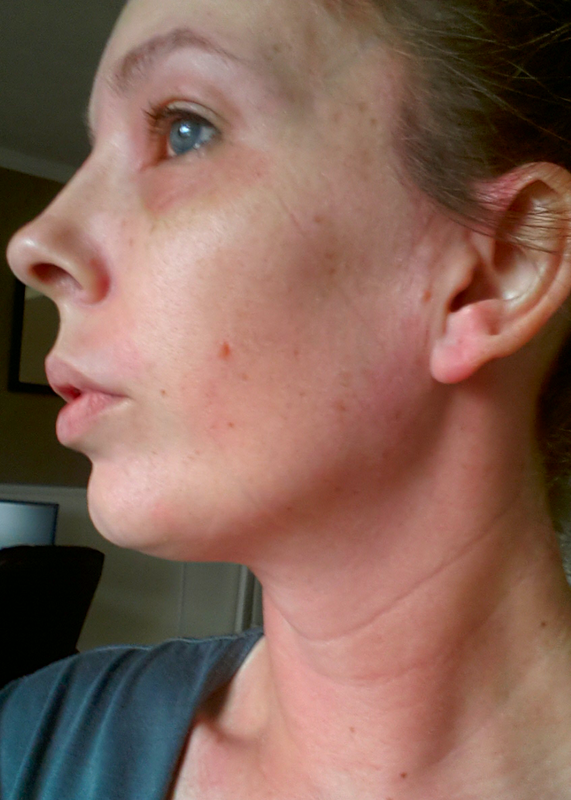 I know that I will have to have a Patch test soon to help figure out the biggest triggers of my contact dermatitis. 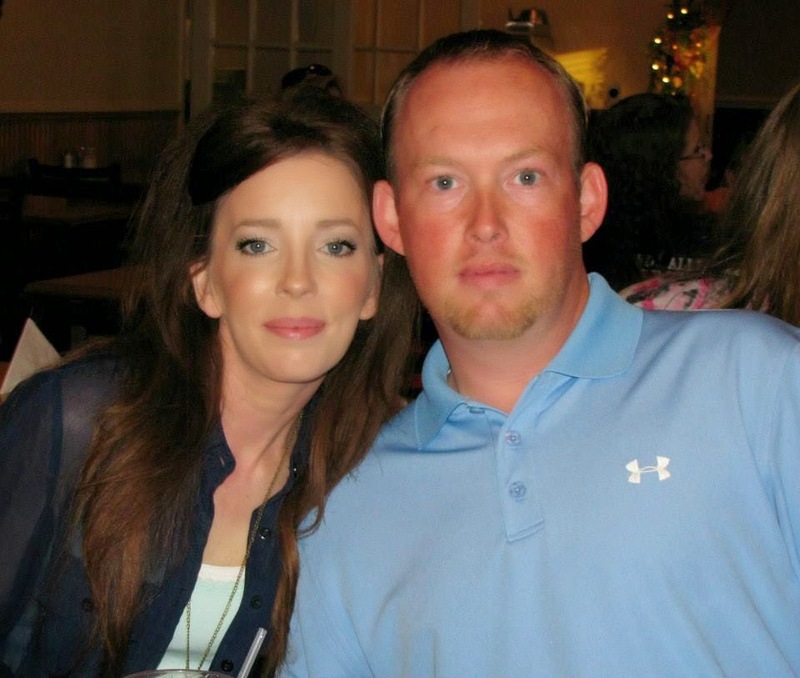 Any prayers and well wishes are much welcome. I just hope this gets better soon. I can't imagine living like this for much longer. I live in fear every day that I will have another reaction. I look forward to getting better inside and out. As of right now... this is the longest stretch of not having a rash since the second week of June. That is fantastic. I am doing what I can to keep it that way. This is a huge wake up call. Just knowing some of the ingredients in beauty products are scary. No longer can I just buy whatever I want. It will be a constant search to find things that are ok for me to put on my skin. You all know that I subscribe to monthly makeup subscriptions and that I review beauty products too... I plan to keep my subscriptions for now. I am not going to review any beauty products until I know what I should be putting on my skin. If I have to make a drastic change in the beauty products I use, I will probably cancel my Makeup Subscriptions (GASP, I know... It was hard for me to even type that.) and search for healthier alternatives. I will keep you all updated. I hope I can take you all on my journey to cleaner eating, organic beauty and makeup products, organic cleaning products and just over all healthier way of living with less chemicals. What I have been going through in no way compares to what some people have to go through in their daily life. I am not fighting cancer. I don't have a disease that may kill me. I want you all to know that I do keep that in perspective. I will get better. My worst days don't even compare to what some people have to go through. I really don't want to give anyone the impression that I expect sympathy. I am only sharing this strange health issue that I am going through. Maybe someone else is going through something similar.